We used to think that if we knew one, we knew two, because one and one are two. We are finding that we must learn a great deal more about "and". Sir Arthur Stanley Eddington OM (28 December 1882 – 22 November 1944) was Plumian Professor of Astronomy at the University of Cambridge. He was arguably the most important astrophysicist of the early 20th century, and was also a successful populariser. He became world-famous in 1919, when his observations of the bending of starlight near the eclipsed sun confirmed predictions made by Albert Einstein in his General Theory of Relativity. Physics has in the main contented itself with studying the abridged edition of the book of nature. It is reasonable to hope that in the not too distant future we shall be competent to understand so simple a thing as a star. ...The present revolution of scientific thought follows in natural sequence on the great revolutions at earlier epochs in the history of science. Einstein's special theory of relativity, which explains the indeterminateness of the frame of space and time, crowns the work of Copernicus who first led us to give up our insistence on a geocentric outlook on nature; Einstein's general theory of relativity, which reveals the curvature or non-Euclidean geometry of space and time, carries forward the rudimentary thought of those earlier astronomers who first contemplated the possibility that their existence lay on something which was not flat. These earlier revolutions are still a source of perplexity in childhood, which we soon outgrow; and a time will come when Einstein's amazing revelations have likewise sunk into the commonplaces of educated thought. At terrestrial temperatures matter has complex properties which are likely to prove most difficult to unravel; but it is reasonable to hope that in the not too distant future we shall be competent to understand so simple a thing as a star. Paraphrased variants: It is sound judgment to hope that in the not too distant future we shall be competent to understand so simple a thing as a star. It is not too much to hope that in the not too distant future we shall be competent to understand so simple a thing as a star. We do not argue with the critic who urges that the stars are not hot enough for this process; we tell him to go and find a hotter place. A star is drawing on some vast reservoir of energy by means unknown to us. This reservoir can scarcely be other than the sub-atomic energy which, it is known, exists abundantly in all matter; we sometimes dream that man will one day learn to release it and use it for his service. The store is well-nigh inexhaustible, if only it could be tapped. I think that science would never have achieved much progress if it had always imagined unknown obstacles hidden round every corner. At least we may peer gingerly round the corner, and perhaps we shall find there is nothing very formidable after all. To the pure geometer the radius of curvature is an incidental characteristic — like the grin of the Cheshire cat. To the physicist it is an indispensable characteristic. It would be going too far to say that to the physicist the cat is merely incidental to the grin. Physics is concerned with interrelatedness such as the interrelatedness of cats and grins. In this case the "cat without a grin" and the "grin without a cat" are equally set aside as purely mathematical phantasies. I shall certainly hit on a tune". We used to think that if we knew one, we knew two, because one and one are two. We are finding that we must learn a great deal more about 'and'. [Relativist] Rel. There is a well-known proposition of Euclid which states that "Any two sides of a triangle are together greater than the third side." Can either of you tell me whether nowadays there is good reason to believe that this proposition is true? [Experimental Physicist] Phys. I cannot imagine myself perceiving non-Euclidean space! Math. Look at the reflection of the room in a polished doorknob, and imagine yourself one of the actors in what you see going on there. Phys. I know that it is often a help to represent pressure and volume as height and width on paper; and so geometry may have applications to the theory of gases. But is it not going rather far to say that geometry can deal directly with these things and is not necessarily concerned with lengths in space? Phys. Yours is a strange subject. You told us at the beginning that you are not concerned as to whether your propositions are true, and now you tell us you do not even care to know what you are talking about. Math. That is an excellent description of Pure Mathematics, which has already been given by an eminent mathematician [Bertrand Russell]. It is the reciprocity of these appearances—that each party should think the other has contracted—that is so difficult to realise. Here is a paradox beyond even the imagination of Dean Swift. Gulliver regarded the Lilliputians as a race of dwarfs; and the Lilliputians regarded Gulliver as a giant. That is natural. If the Lilliputians had appeared dwarfs to Gulliver, and Gulliver had appeared a dwarf to the Lilliputians—but no! that is too absurd for fiction, and is an idea only to be found in the sober pages of science. ...It is not only in space but in time that these strange variations occur. If we observed the aviator carefully we should infer that he was unusually slow in his movements; and events in the conveyance moving with him would be similarly retarded—as though time had forgotten to go on. His cigar lasts twice as long as one of ours. ...But here again reciprocity comes in, because in the aviator's opinion it is we who are travelling at 161,000 miles a second past him; and when he has made all allowances, he finds that it is we who are sluggish. Our cigar lasts twice as long as his. It is of interest to inquire what happens when the aviator's speed... approximates to the velocity of light. Lengths in the direction of flight become smaller and smaller, until for the speed of light they shrink to zero. The aviator and the objects accompanying him shrink to two dimensions. We are saved the difficulty of imagining how the processes of life can go on in two dimensions, because nothing goes on. Time is arrested altogether. This is the description according to the terrestrial observer. The aviator himself detects nothing unusual; he does not perceive that he has stopped moving. He is merely waiting for the next instant to come before making the next movement; and the mere fact that time is arrested means that he does not perceive that the next instant is a long time coming. Spherical space is not very easy to imagine. We have to think of the properties of the surface of a sphere—the two-dimensional case—and try to conceive something similar applied to three-dimensional space. Stationing ourselves at a point let us draw a series of spheres of successively greater radii. The surface of a sphere of radius r should be proportional to r2; but in spherical space the areas of the more distant spheres begin to fall below the proper proportion. There is not so much room out there as we expected to find. Ultimately we reach a sphere of biggest possible area, and beyond it the areas begin to decrease. The last sphere of all shrinks to a point—our antipodes. Is there nothing beyond this? Is there a kind of boundary there? There is nothing beyond and yet there is no boundary. On the earth's surface there is nothing beyond our own antipodes but there is no boundary there. We can see that, the constant in the law of gravitation being fixed, there may be some upper limit to the amount of matter possible; as more and more matter is added in the distant parts, space curves round and ultimately closes; the process of adding more matter must stop, because there is no more space, and we can only return to the region already dealt with. But there seems nothing to prevent a defect of matter, leaving space unclosed. Some mechanism seems to be needed, whereby either gravitation creates matter, or all the matter in the universe conspires to define a law of gravitation. We have found a strange foot-print on the shores of the unknown. We have devised profound theories, one after another, to account for its origins. At last, we have succeeded in reconstructing the creature that made the footprint. And lo! It is our own. The frank realization that physical science is concerned with a world of shadows is one of the most significant of recent advances. It is not at all necessary that every individual symbol that is used should represent something in common experience or even something explicable in terms of common experience. The stuff of the world is mind-stuff. The mind-stuff is not spread in space and time. But we must presume that in some other way or aspect it can be differentiated into parts. Only here and there does it arise to the level of consciousness, but from such islands proceeds all knowledge. The idealistic tinge in my conception of the physical world arose out of mathematical researches on the relativity theory. In so far as I had any earlier philosophical views, they were of an entirely different complexion. From the beginning I have been doubtful whether it was desirable for a scientist to venture so far into extra-scientific territory. The primary justification for such an expedition is that it may afford a better view of his own scientific domain. In physics we have outgrown archer and apple-pie definitions of the fundamental symbols. To a request to explain what an electron really is supposed to be we can only answer, "It is part of the A B C of physics". The external world of physics has thus become a world of shadows. In removing our illusions we have removed the substance, for indeed we have seen that substance is one of the greatest of our illusions. Later perhaps we may inquire whether in our zeal to cut out all that is unreal we may not have used the knife too ruthlessly. Perhaps, indeed, reality is a child which cannot survive without its nurse illusion. But if so, that is of little concern to the scientist, who has good and sufficient reasons for pursuing his investigations in the world of shadows and is content to leave to the philosopher the determination of its exact status in regard to reality. In the world of physics we watch a shadowgraph performance of the drama of familiar life. The shadow of my elbow rests on the shadow table as the shadow ink flows over the shadow paper. It is all symbolic, and as a symbol the physicist leaves it. Then comes the alchemist Mind who transmutes the symbols. The sparsely spread nuclei of electric force become a tangible solid; their restless agitation becomes the warmth of summer; the octave of aethereal vibrations becomes a gorgeous rainbow. Nor does the alchemy stop here. In the transmuted world new significances arise which are scarcely to be traced in the world of symbols; so that it becomes a world of beauty and purpose — and, alas, suffering and evil. The frank realisation that physical science is concerned with a world of shadows is one of the most significant of recent advances. The quest of the absolute leads into the four-dimensional world. This is a favourite device that mathematical equations resort to, when we propound stupid questions. Shuffling is the only thing which Nature cannot undo. Never mind what two tons refers to. What is it? How has it entered in so definite a way into our exprerience? Two tons is the reading of the pointer when the elephant was placed on a weighing machine. Let us pass on. … And so we see that the poetry fades out of the problem, and by the time the serious application of exact science begins we are left only with pointer readings. Schrödinger's wave-mechanics is not a physical theory, but a dodge — and a very good dodge too. The universe is of the nature of a thought or sensation in a universal Mind... To put the conclusion crudely — the stuff of the world is mind-stuff. As is often the way with crude statements, I shall have to explain that by "mind" I do not exactly mean mind and by "stuff" I do not at all mean stuff. Still that is about as near as we can get to the idea in a simple phrase. The mind-stuff of the world is something more general than our individual conscious minds; but we may think of its nature as not altogether foreign to feelings in our consciousness... Having granted this, the mental activity of the part of world constituting ourselves occasions no great surprise; it is known to us by direct self-knowledge, and we do not explain it away as something other than we know it to be — or rather, it knows itself to be. The mind-stuff is not spread in space and time. But we must presume that in some other way or aspect it can be differentiated into parts. Only here and there does it arise to the level of consciousness, but from such islands proceeds all knowledge. The latter includes our knowledge of the physical world. Consciousness is not sharply defined, but fades into sub-consciousness; and beyond that we must postulate something indefinite but yet continuous with our mental nature. This I take it be the world-stuff. It is difficult for the matter-of-fact physicist to accept the view that the substratum of everything is of mental character. But no one can deny that mind is the first and most direct thing in our experience, and all else is remote inference — inference either intuitive or deliberate. I think it is not irreligion but a tidiness of mind, which rebels against the idea of permeating scientific research with a religious implication. There is another passage from the Old Testament that comes nearer to my own sympathies—"And behold the Lord passed by, and a great and strong wind rent the mountains, and brake in pieces the rocks before the Lord; but the Lord was not in the wind: and after the wind an earthquake; but the Lord was not in the earthquake: and after the earthquake a fire; but the Lord was not in the fire: and after the fire a still small voice. ...And behold there came a voice unto him, and said. What doest thou here, Elijah?" Wind, earthquake, fire—meteorology, seismology, physics—pass in review, as we have been reviewing the natural forces of evolution; the Lord was not in them. Afterwards, a stirring, an awakening in the organ of the brain, a voice which asks "What doest thou here?" If to-day you ask a physicist what he has finally made out the æther or the electron to be, the answer will not be a description in terms of billiard balls or fly-wheels or anything concrete; he will point instead to a number of symbols and a set of mathematical equations which they satisfy. What do the symbols stand for? The mysterious reply is given that physics is indifferent to that; it has no means of probing beneath the symbolism. To understand the phenomena of the physical world it is necessary to know the equations which the symbols obey but not the nature of that which is being symbolised. ...this newer outlook has modified the challenge from the material to the spiritual world. We are no longer tempted to condemn the spiritual aspects of our nature as illusory because of their lack of concreteness. We have travelled far from the standpoint which identifies the real with the concrete. Even the older philosophy found it necessary to admit exceptions; for example, time must be admitted to be real, although no one could attribute to it a concrete nature. Matter and all else that is in the physical world have been reduced to a shadowy symbolism. The chairs and tables around us which broadcast to us incessantly those signals which affect our sight and touch cannot in their nature be like unto the signals or to the sensations which the signals awake at the end of their journey. Physics most strongly insists that its methods do not penetrate behind the symbolism. Mind is the first and most direct thing in our experience; all else is remote inference. It remains a real world if there is a background to the symbols—an unknown quantity which the mathematical symbol x stands for. We think we are not wholly cut off from this background. It is to this background that our own personality and consciousness belong, and those spiritual aspects of our nature not to be described by any symbolism... to which mathematical physics has hitherto restricted itself. Our story of evolution ended with a stirring in the brain-organ of the latest of Nature's experiments; but that stirring of consciousness transmutes the whole story and gives meaning to its symbolism. Symbolically it is the end, but looking behind the symbolism it is the beginning. The problem of experiences is not limited to the interpretation of sense-impressions. As truly as the mystic, the scientist is following a light; and it is not a false or an inferior light. Study of the scientific world cannot prescribe the orientation of something which is excluded from the scientific world. The scientific answer is relevant so far as concerns the sense-impressions... For the rest the human spirit must turn to the unseen world to which it itself belongs. Consciousness is not wholly, nor even primarily a device for receiving sense-impressions. ...there is another outlook than the scientific one, because in practice a more transcendental outlook is almost universally admitted. ...who does not prize these moments that reveal to us the poetry of existence? Our system of philosophy is itself on trial; it must stand or fall according as it is broad enough to find room for this experience as an element of life. Our environment may and should mean something towards us which is not to be measured with the tools of the physicist or described by the metrical symbols of the mathematician. What I may attempt is to dispel the feeling that in using the eye of the body or the eye of the soul, and incorporating what is thereby revealed in our conception of reality, we are doing something irrational and disobeying the leading of truth which as scientists we are pledged to serve. Materialism in its literal sense is long since dead. ...It is ...belief in the universal dominance of scientific law which is nowadays generally meant by materialism. To those who have any intimate acquaintance with the laws of chemistry and physics the suggestion that the spiritual world could be ruled by laws of allied character is as preposterous as the suggestion that a nation could be ruled by laws like the laws of grammar. The essential difference, which we meet in entering the realm of spirit and mind, seems to hang round the word "Ought." Even if religion and morality are dismissed as illusion, the word "Ought" still has sway. The laws of logic do not prescribe the way our minds think; they prescribe the way our minds ought to think. The mind has an outlook which transcends the natural law by which it functions. If God is as real as the shadow of the Great War on Armistice Day, need we seek further reason for making a place for God in our thoughts and lives? We shall not be concerned if the scientific explorer reports that he is perfectly satisfied that he has got to the bottom of things without having come across either. We do not want a religion that deceives us for our own good. Theological or anti-theological argument to prove or disprove the existence of a deity seems to me to occupy itself largely with skating among the difficulties caused by our making a fetish of this word [existence]. The exploration of the external world by the methods of physical science leads not to a concrete reality but to a shadow world of symbols, beneath which those methods are unadapted for penetrating. Physical science comes nearest to that complete system of exact knowledge which all sciences have before them as an ideal. Some fall far short of it. The physicist who inveighs against the lack of coherence and the indefiniteness of theological theories, will probably speak not much less harshly of the theories of biology and psychology. They also fail to come up to his standard of methodology. On the other side of him stands an even superior being—the pure mathematician—who has no high opinion of the methods of deduction used in physics, and does not hide his disapproval of the laxity of what is accepted as proof in physical science. And yet somehow knowledge grows in all these branches. Wherever a way opens we are impelled to seek by the only methods that can be devised for that particular opening, not over-rating the security of our finding, but conscious that in this activity of mind we are obeying the light that is in our nature. If in a community of the blind one man suddenly received the gift of sight, he would have much to tell which would not be at all scientific. We have to build the spiritual world out of symbols taken from our own personality, as we build the scientific world out of the symbols of the mathematician. Science has an important part to play in our everyday existence, and there is far too much neglect of science; but its intention is to supplement not to supplant the familiar outlook. If the kind of controversy which so often springs up between modernism and traditionalism in religion were applied to more commonplace affairs of life we might see some strange results. ...It arises, let us say, from a passage in an obituary notice which mentions that the deceased had loved to watch the sunsets from his peaceful country home.. ...it is forgotten that what the deceased man looked out for each evening was an experience and not a creed. It is perhaps difficult sufficiently to emphasise Seeking without disparaging its correlative Finding. But I must risk this, for Finding has a clamorous voice that proclaims its own importance; it is definite and assured, something that we can take hold of —that is what we all want, or think we want. Yet how transitory it proves. The finding of one generation will not serve for the next. It tarnishes rapidly except it be reserved with an ever-renewed spirit of seeking. You will understand the true spirit neither of science nor of religion unless seeking is placed in the forefront. If our so-called facts are changing shadows, they are shadows cast by the light of constant truth. So too in religion we are repelled by that confident theological doctrine... but we need not turn aside from the measure of light that comes into our experience showing us a Way through the unseen world. Let us then take the whole universe as our standard of constancy, and adopt the view of a cosmic being whose body is composed of intergalactic spaces and swells as they swell. Or rather we must now say it keeps the same size, for he will not admit that it is he who has changed. Watching us for a few thousand million years, he sees us shrinking; atoms, animals, planets, even the galaxies, all shrink alike; only the intergalactic spaces remain the same. The earth spirals round the sun in an ever‑decreasing orbit. It would be absurd to treat its changing revolution as a constant unit of time. The cosmic being will naturally relate his units of length and time so that the velocity of light remains constant. Our years will then decrease in geometrical progression in the cosmic scale of time. On that scale man's life is becoming briefer; his threescore years and ten are an ever‑decreasing allowance. Owing to the property of geometrical progressions an infinite number of our years will add up to a finite cosmic time; so that what we should call the end of eternity is an ordinary finite date in the cosmic calendar. But on that date the universe has expanded to infinity in our reckoning, and we have shrunk to nothing in the reckoning of the cosmic being. Clearly a statement cannot be tested by observation unless it is an assertion about the results of observation. Let us suppose that an ichthyologist is exploring the life of the ocean. He casts a net into the water and brings up a fishy assortment. Surveying his catch, he proceeds in the usual manner of a scientist to systematise what it reveals. He arrives at two generalisations: No sea-creature is less than two inches long. (2) All sea-creatures have gills. These are both true of his catch, and he assumes tentatively that they will remain true however often he repeats it. An onlooker may object that the first generalisation is wrong. "There are plenty of sea-creatures under two inches long, only your net is not adapted to catch them." The icthyologist dismisses this objection contemptuously. "Anything uncatchable by my net is ipso facto outside the scope of icthyological knowledge. In short, what my net can't catch isn't fish." Or — to translate the analogy — "If you are not simply guessing, you are claiming a knowledge of the physical universe discovered in some other way than by the methods of physical science, and admittedly unverifiable by such methods. You are a metaphysician. Bah!" The equations of gravitation... signify that whenever we recognise the existence of one of these physical magnitudes it is always accompanied by corresponding curvatures of space-time. It is usual to assume that the curvatures are produced by those concrete somethings which we call mass, momentum, energy, pressure. In this way, we must concede a duality to nature; there would exist both matter and space-time, or, better still, matter and the metrical field of space-time. Einstein... attempted to remove this duality by proving that it was possible to attribute the entire existence of the metrical field, hence of space-time, to the presence of matter. This attitude led to a matter-moulding conception of the universe... And... only when this attitude was adhered to could Mach's belief in the relativity of all motion be accepted. Eddington's attitude is just the reverse. He prefers to assume that the equations of gravitation are not equations in the ordinary sense of something being equal to something else. In his opinion they are identities. They merely tell us how our senses will recognize the existence of certain curvatures of space-time by interpreting them as matter, motion, and so on. In other words, there is no matter; there is nothing but a variable curvature of space-time. Matter, momentum, vis viva, are the names we give to those curvatures on account of the varying ways they affect our senses. Our sense experience has to be supplemented by all kinds of images and formulas to tell us much about the outer world, just as we learn something about the nonphysical one from mythical images tested out in experience. Arthur Eddington has discussed at length the strange way that man receives his knowledge of the physical world in Science and the Unseen World. Mythological thinking is not as strange as some people think once they begin to see the total universe as it is. The best presentation of the general theory [of relativity] is still Eddington's book of 1923, The Mathematical Theory of Relativity. ...The mathematical foundation, the calculus of tensors, is given very completely in Eddington's book. For an exhaustive treatment see: Levi-Cevita, The Absolute Differential Calculus, translated by Dr. E. Perisco (1927). The solution... was found only after the rise of nuclear physics, and, strange to relate, was not known to Eddington when he developed his celebrated theory of stellar structure between 1916 and 1924. Indeed, it is one of the most intriguing facts in the history of science that the two most influential theories concerning the stars—Newton's theory of gravitation and Eddington's theory of stellar construction—were each developed so successfully although Newton was ignorant of the origin of gravitation and Eddington of the origin of stellar energy. With regard to the Newtonian concept of absolute rotation, Eddington admitted that Einstein's plenum does in fact provide a world-wide inertial frame, with respect to which it can be measured. 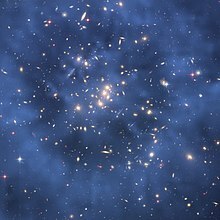 Nevertheless, Eddington believed that Einstein attributed to important a role to matter, for in his universe it appears that not only the metrical properties, as in General Relativity, but the very existence of space depends on the existence of matter. Eddington preferred to regard matter as a manifestation of the 'structure' of space-time. Gerald James Whitrow, The Structure of the Universe: An Introduction to Cosmology (1949). Though sometimes attributed to Eddington without citation, this seems to be derived from a statement by J. B. S. Haldane, in Possible Worlds and Other Papers (1927), p. 286: The Universe is not only queerer than we suppose, but queerer than we can suppose. Variants: The universe is not only stranger than we imagine, it is stranger than we can imagine. The world is not only stranger than we imagine, it is stranger than we can imagine. If we had never seen a star, we nevertheless could have theoretically deduced its existence. This page was last edited on 27 December 2018, at 04:02.